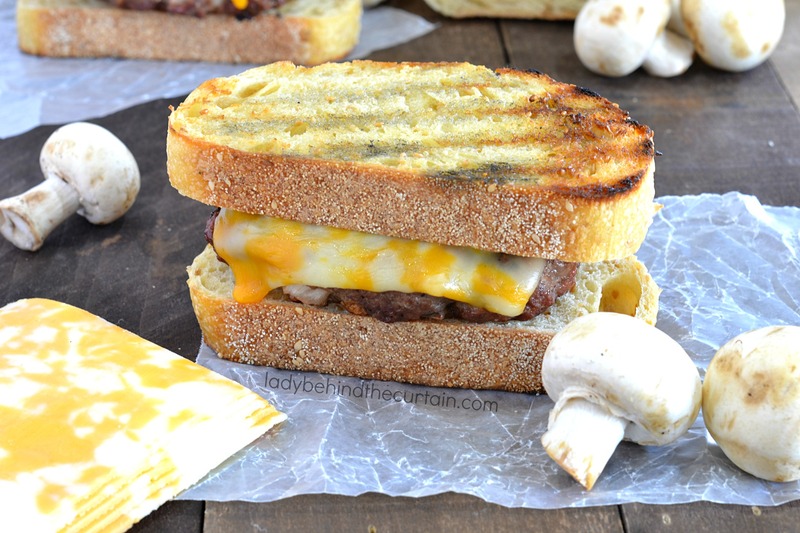 Grilled Cheddar Burgers | Summer or Winter these delicious burgers can be made on an outdoor grill or on your stove top (scroll down to see how)! 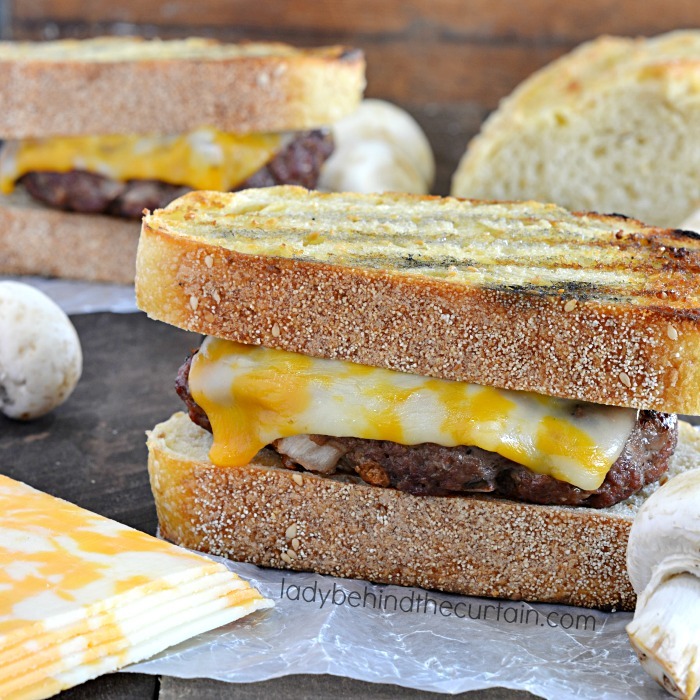 A wonderfully juicy burger with fresh ingredients like mushrooms, onion and a few more ingredients to add a lot of flavor all encased in melted cheese and topped with crusty toasted French bread. Now that’s a burger for any type of weather! If you’re like me you would love to be able to have a juicy burger year round! Now you can! 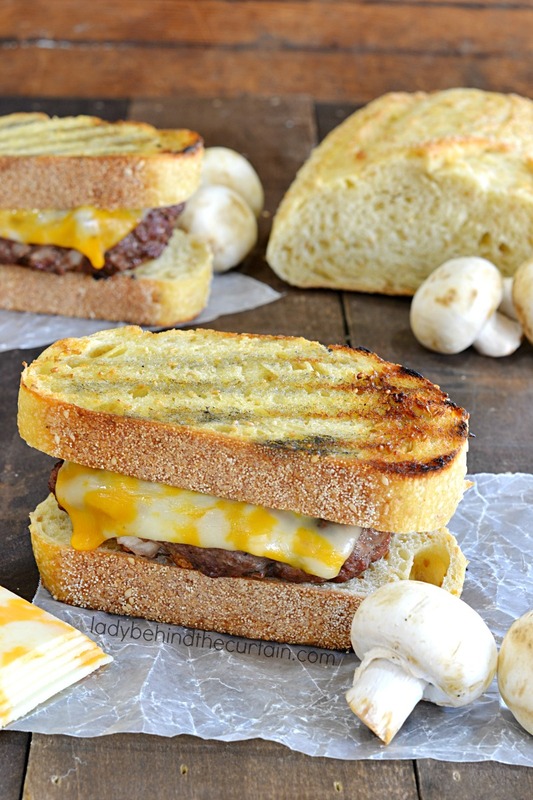 Get your burger patties ready…..here are three different options of “grilling”. IF USING A GRILL: Heat a gas grill to high or heat coals in a charcoal grill until they glow bright orange and ash over. Brush the burgers with the oil. Grill the burgers until golden brown and slightly charred on the first side, about 3 minutes for beef and 5 minutes for turkey. Flip over the burgers. Cook beef burgers until golden brown and slightly charred on the second side, 4 minutes for medium rare (3 minutes if topping with cheese; see step 3) or until cooked to desired degree of doneness. Cook turkey burgers until cooked throughout, about 5 minutes on the second side. Courtesy of the perfect burger from Bobby Flay. IF USING A GRILL PAN: Heat a grill pan over high heat on top of the stove. Cook the burgers as for a grill, above. . Courtesy of the perfect burger from Bobby Flay. IF USING A SAUTE PAN OR GRIDDLE (PREFERABLY CAST IRON): Heat the oil in the pan or griddle over high heat until the oil begins to shimmer. Cook the burgers until golden brown and slightly charred on the first side, about 3 minutes for beef and 5 minutes for turkey. Flip over the burgers. Cook beef burgers until golden brown and slightly charred on the second side, 4 minutes for medium rare (3 minutes if topping with cheese) or until cooked to desired degree of doneness. Cook turkey burgers until cooked throughout, about 5 minutes on the second side. . Courtesy of the perfect burger from Bobby Flay. Mix together ground beef, mushrooms, onion, garlic powder, salt, pepper and Worcestershire sauce. Form into 4 oval shaped patties (to match the shape of the bread slices). Use preferred cooking method (see above). Add cheese. Slice French bread into 8 (1½-inch) pieces, butter one side of each piece. Grill until toasted. 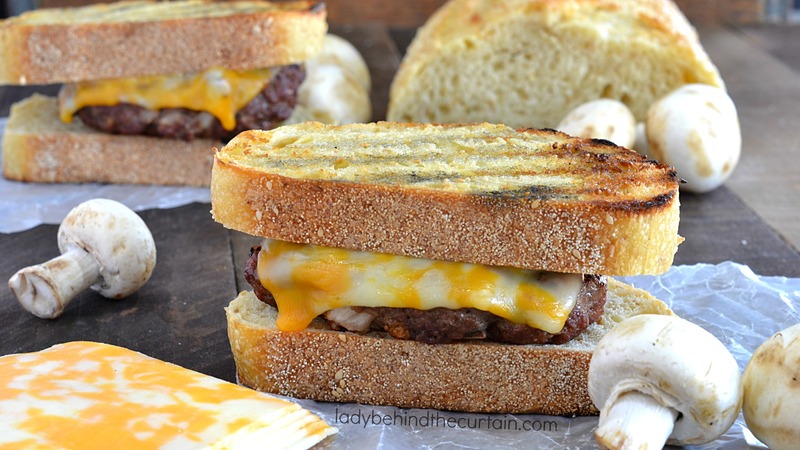 A simple way to take your cheeseburgers to the next level! These look terrific!Bookmarked and will try them soon. Thanks so much for sharing the recipe, Sheryl!